With the Presidential race taking some twists and turns since Labor Day I thought it was time to put up a new map, and take a look at the race after Hillary Clinton had arguably her worst stretch since the Conventions. Without question the race has tightened, in national polling, but more importantly in key swing state polling, where some important changes have occurred. I am going to review changes to my last map, and see where that leaves us. In both of my previous postings I have highlighted, for Donald Trump, the absolute necessity of winning Florida. That is still the case. I just cannot see the path to 270 for him without it. But his difficulty in getting to 270 is shown by this map, where even wins in Florida and Ohio do not bring him victory. 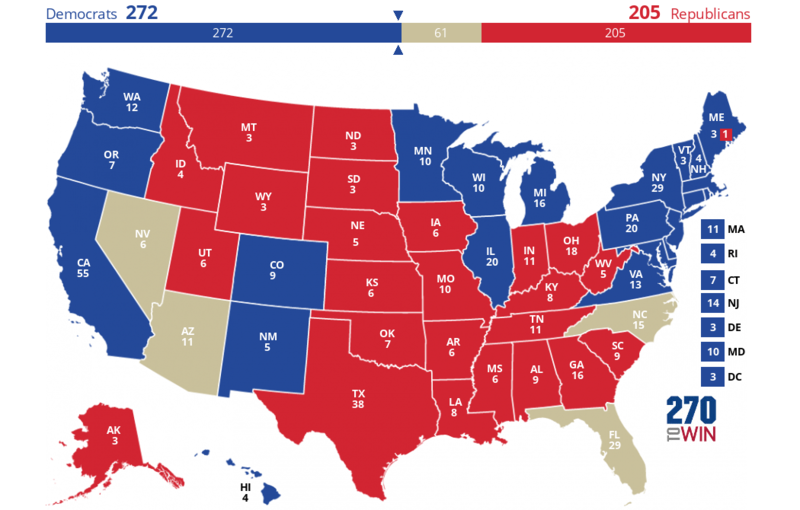 Let us look at the changes from my last map, all of which favor Trump. I have moved a group of states I had previously designated as “toss-up” into the Trump column, including Utah, Georgia, Iowa and most importantly Ohio. I am not entirely convinced on Ohio, but the trend lines, for two weeks, have favored Trump. (Reading numbers should not be impacted by partisan desires, which many forget) I have also assigned the 1 electoral vote in Maine Congressional 2 to Trump, although I believe that the state will remain solidly blue. With the race tightening it still remains, in my opinion, Clinton’s race to lose. But with that tightening comes some focus on the swing states that now become very important for her. As I look at this map the focus, for me, comes onto New Hampshire, Colorado and Nevada. Those states need to be maintained as Democratic, or the map could skewer in a negative way for Democrats. I have left North Carolina as undecided, and a loss there would likely finish Trump. Trump really needs to run the table in order to win this thing. The debates loom as potentially more important than ever in a Presidential race. Even with a tough couple of weeks I still have Clinton over 270, with a narrow road to victory for Trump. I am waiting for the electoral map from Ted Panos over at WCAP, who seems very reluctant to take up the challenge, and show me the error of my ways. Come on in Teddy. Give me the map. This entry was posted in Electoral Map and tagged Electoral College 2016. Bookmark the permalink.